Halloween is here and this time of year it is extra fun to “decorate” your food by going with the scary theme. Here are some spooky Halloween meal ideas to make the season more fun and exciting. Spooky Spaghetti is really easy to make. Simply slice circles into mozzarella cheese and add a sliced black olive in the middle to look like eyeballs. 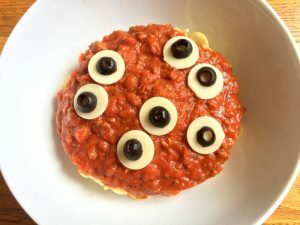 Put the “eyeballs” over your regular pasta sauce and you now have Spooky Spaghetti. Need a classic pasta sauce recipe? Here is my husband’s favorite straight from his Italian heritage: Pasta Sauce. Who doesn’t love pizza? This spooky pizza can be a quick afternoon snack or part of a meal. Simply use an English muffin sliced in half. Add 1 Tablespoon of tomato paste or pasta sauce to each half. Using a slice of cheese, cut it into a ghost shape. Cut a sliced olive in half so that the 2 slices make slits for eyes. Put the pizza in the oven under Broil until the cheese is slightly melted and the muffin is warm. About 2-3 minutes. 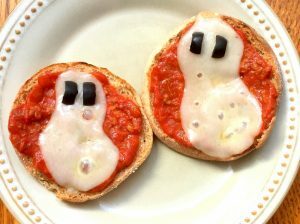 You now have a spooky ghost mini pizza. Watch the quick video on how to make regular Mini Pizzas. 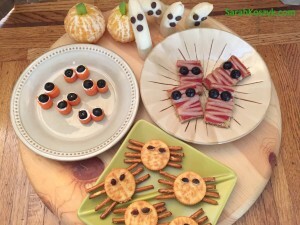 Get more ideas on fun and spooky Halloween snacks and appetizers from Banana Ghosts, Spider Crackers, “Pumpkins” using oranges and celery, Edible Eyeballs, and more. These are all fast and delicious, too.